Rescued from oblivion by Jello Biafra and his inimitable Alternative Tentacles label, Timeless is, at least for now, the definitive document of one of the strangest groups ever to walk this earth - or any other planet, for that matter. Born out of the same overlit L.A. vacuum that produced hordes of both faceless and fascist rockers in the 70s, Zolar X seemed, at the time, nothing more than a bizarre novelty. However, while their glam/glitter/space rock was firmly rooted in Ziggy-era Bowie, the group's jet-propelled outer space anthems skirted territory that would later be mined by a host of Mohawk-coiffed, safety-pin clad punkers in the late 70s and early 80s. Sporting attire and make-up that would suggest the group raided the wardrobes of The Jetsons, Mr. Spock and an Ed Wood movie, Zolar X persevered throughout the freak parade of the 70s, recording only one full-length album and an extended play demo, before hanging up the starboots and swept eyebrows for lives of alternating placidity and depravity somewhere along the golden coast of California. 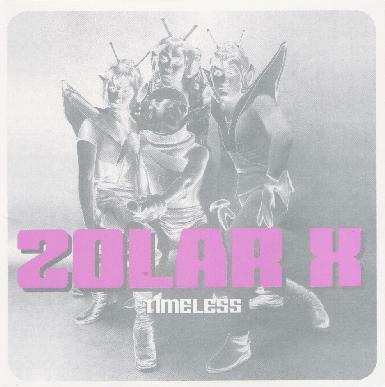 Timeless collects virtually everything that Zolar X recorded during its turbulent eight year exile on Earth. And there are some precious moongems here scattered among the cosmic debris. At their best, Zolar X combined the chainsaw drive of The Stooges, the moxy of the New York Dolls, the psychic weirdness of The Residents and the lyrical absurdity of a Marvin the Martian cartoon, and songs like "Energize Me," "Jet Star 19" and "Space Age Love" all bear witness to the group's tongue-in-cheek send up of a parallel future America inundated with sleazy mutants, horny androids and neurotic robots. And while there are certainly some direct steals from Bowie ("Moonbeams" and "Silver Shapes"), extended tracks like "Horizon Suite" and "Parallel Galaxy" show the group aiming its antennae at a far more ambitious enterprise - a kind of art rock version of The Ramones jamming with KISS at a Starfleet Academy sockhop. Not entirely successful but endearing and apparently in earnest. But when they hit warp drive, they crash and burn with all the explosive energy of a photon torpedo. Tracks like "Timeless" and "Rocket Roll" earn their stars with a punky freneticism reminiscent of the Dead Kennedys, while "Science" and "Test Tube Baby" play out like inspired outtakes from a long lost Robert Calvert concept album about the wonders and dangers of uncontrolled and uncontrollable science in the 21st century. Fortunately, Zolar X never takes itself or its outrageous concept seriously. Such an ingenuous attitude to the pure joys of rock 'n' roll gives Timeless a reverberant freshness and an evanescent warmth that the music of most other platform-booted glam shock rockers always lacked. Timeless is definitely a real blast from a past that can now only be glimpsed through the fading mist and flashing xenon of a thousand crashed fog machines and strobes, rusting away somewhere on a back lot in the Hollywood Hills.